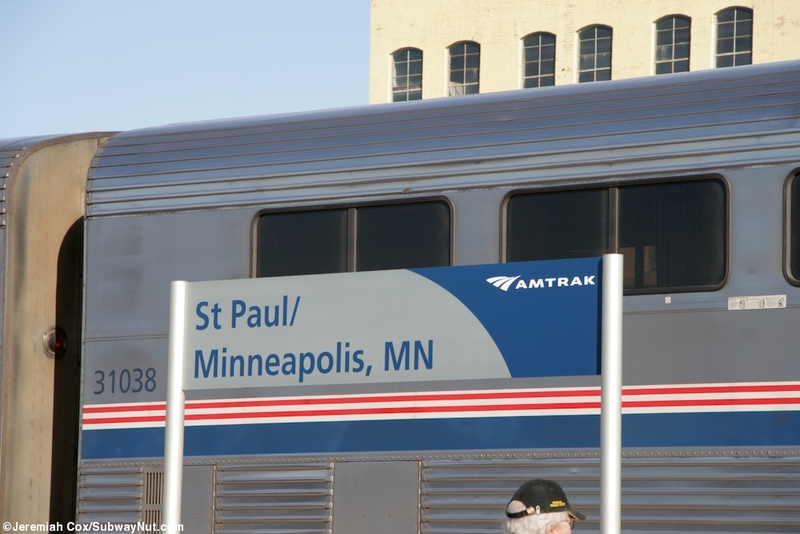 St. Paul-Minneapolis Midway Station is named midway just for that reason. 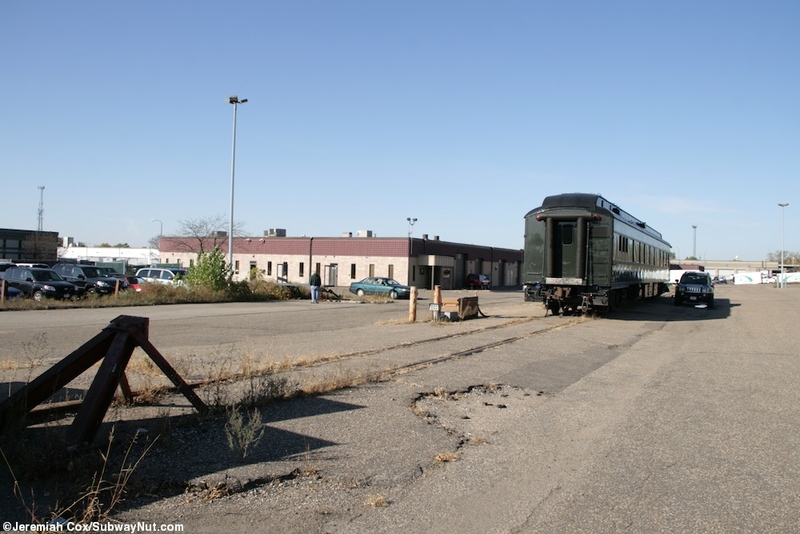 It is roughly midway between the downtowns of each city of the Twin Cities, technically located in St. Paul in an industrial area with absolutely nothing around. 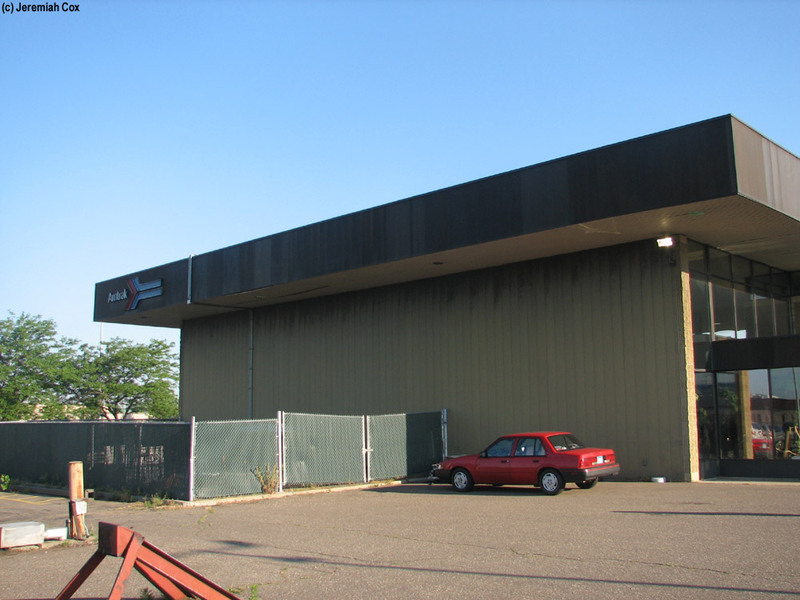 The station is set back from the street and designed for automobile access with a large parking lot in front. 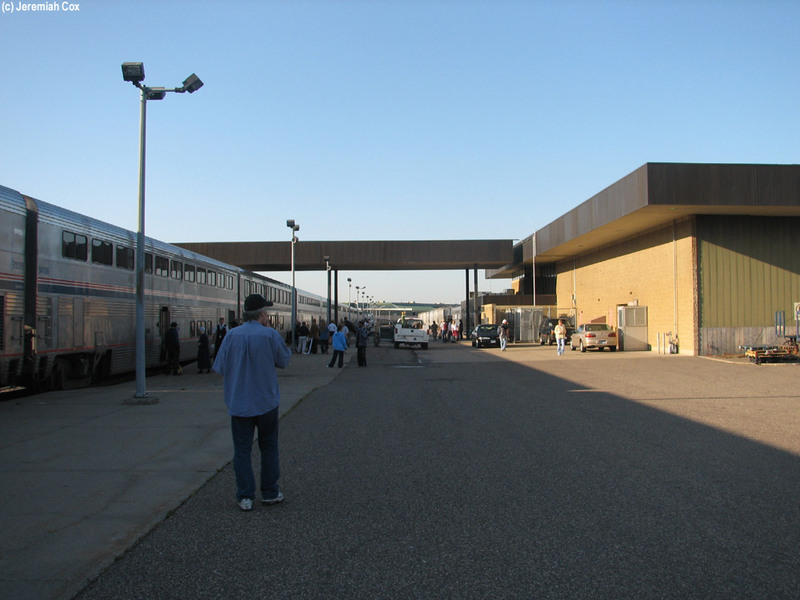 Passengers arriving on foot from the three bus lines that stop on University Avenue a block and a half away down Transfer Road have to walk by the parking lot signage that specifically specifies "Amtrak: Twin Cities Passenger Station Entrance" or "Exit". 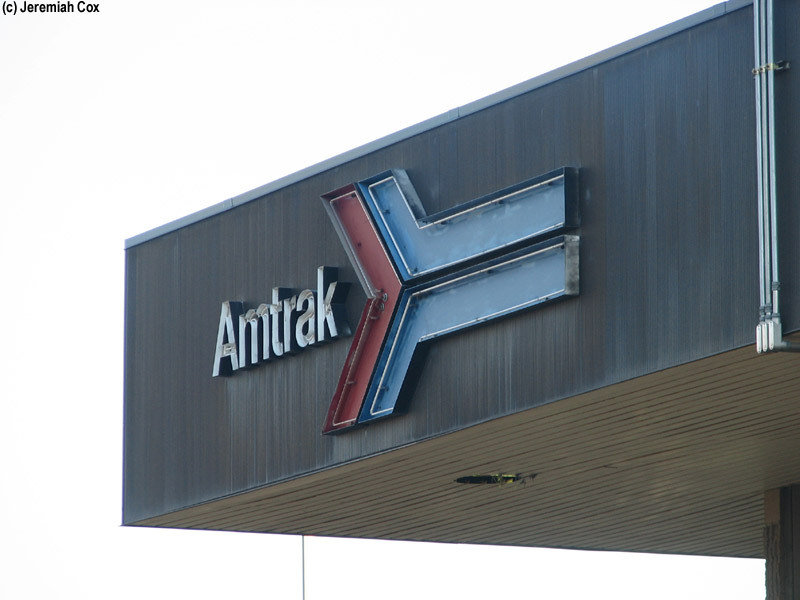 These signs and signposts are white with the Amtrak logo above them. University Avenue is currently a giant construction project mess due to the construction of the Central Corridor Light Rail Line that will connect the existing Hiawatha Line near downtown Minneapolis with downtown St. Paul. This current station though will probably never see a light rail train connection when it is due to open in 2014. 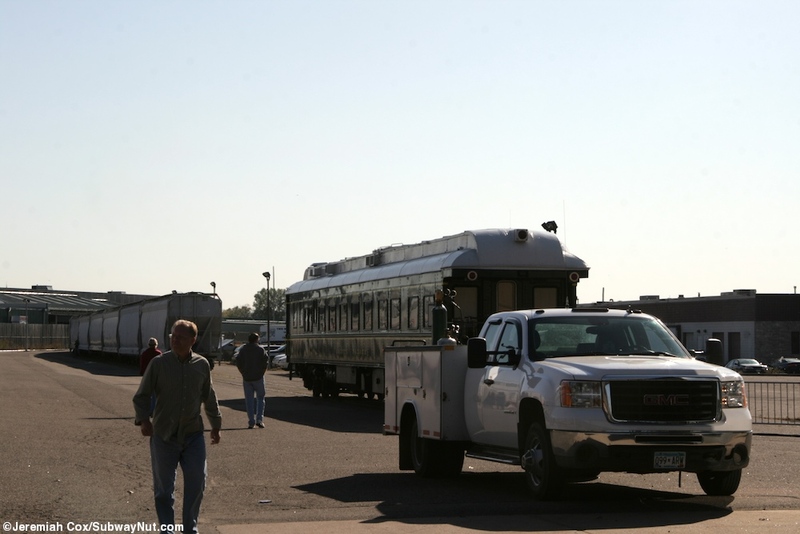 Right now preparations are under way for an Amtrak move into the St. Paul Union Depot in 2012, which will have the light rail terminus built right outside the front streetside door. 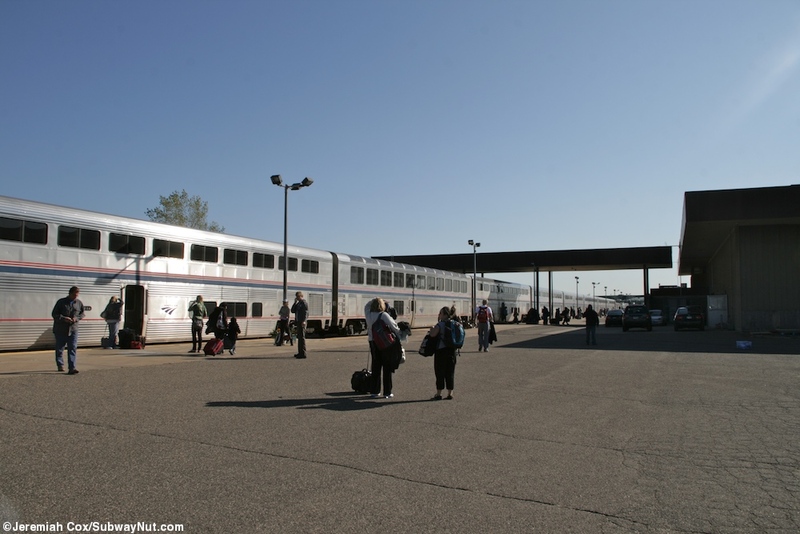 This will mean Amtrak during its 40+ year history has slowly moved across the Twin Cities. 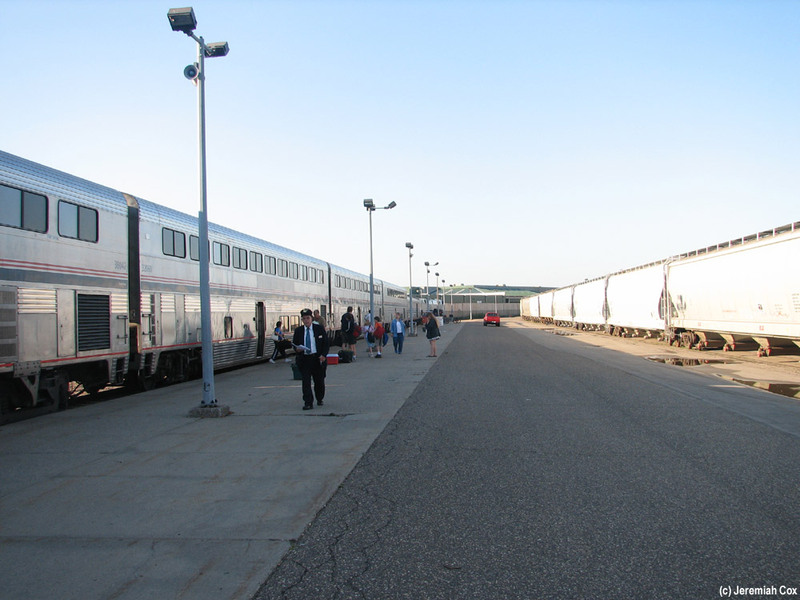 From Amtrak's founding in 1971 to 1978 it consolidated operations and served the historic, now demolished Minneapolis Great Northern Depot. 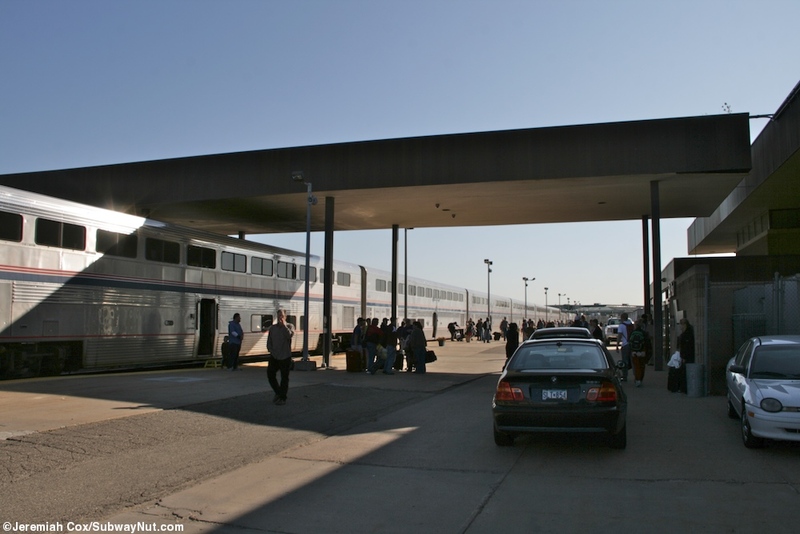 Today's midway station opened in 1978 and entering the minimalist large two story brick station house with a black flat roof (similar to all the other modular Amtrak stations of the era, this one is just the biggest of them all) feels like you have entered a time warp to that decade of early Amtrak. 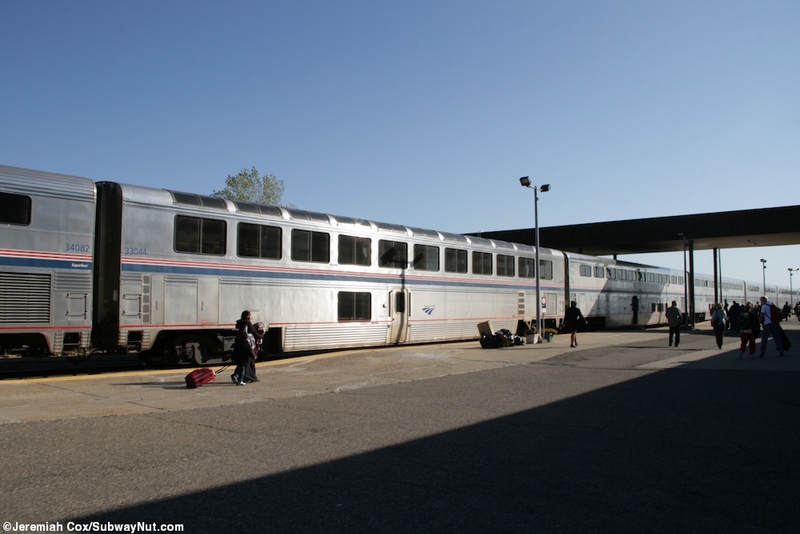 There is plenty of large minimalist text white signage on black backgrounds with signs directing passengers to Phone, Train, Tickets, Baggage Claim ect. 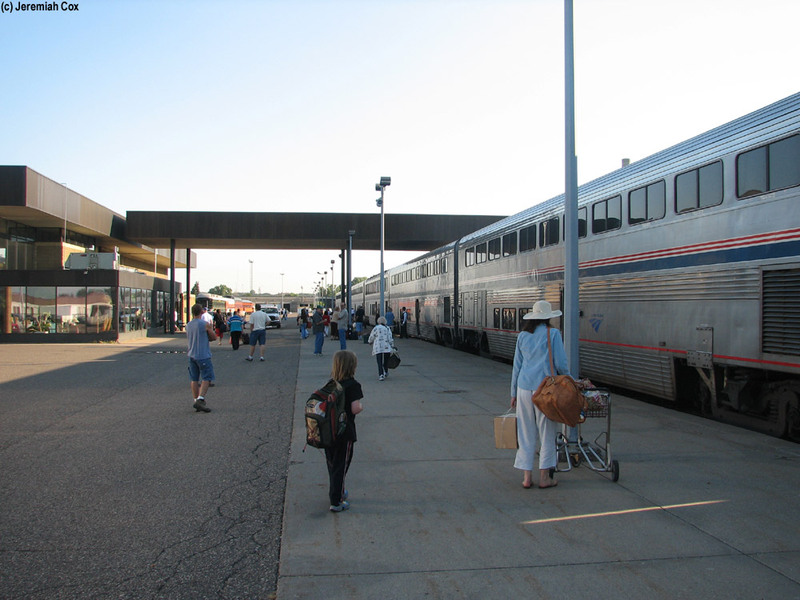 On the large parking lot side of the station there are two entrances one says Baggage and leads directly to right in front of the Baggage Claim inside the station located in the corner taken up by Amtrak's offices. This corridor continues down with a red tiled floor and there is a desk for Hertz local edition rental cars before reaching the main public area of the station. Turning 90 degrees along the walls of the same non-public area where the baggage claim is, is the ticket office complete with a back wall with old Amtrak photographs that say Travel by Train. Throughout the station are historic posters signs and photos. 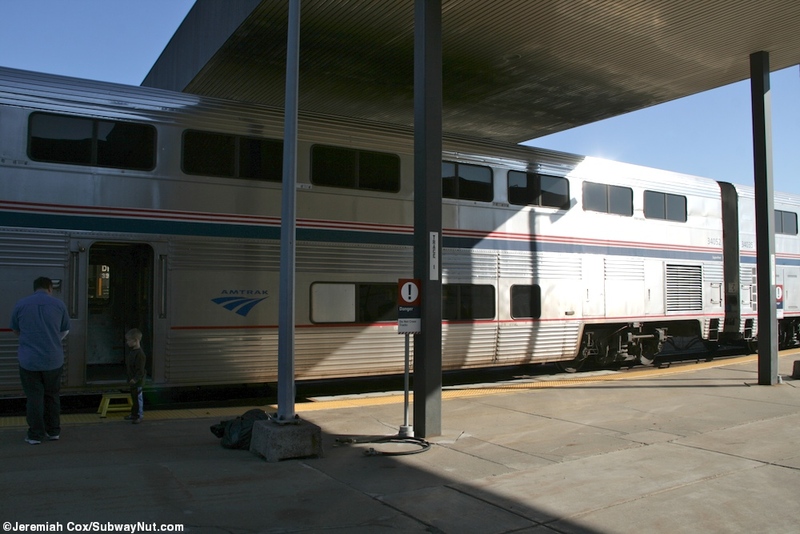 The rest of the central portion of the station is taken up by the main waiting area and a narrow central staircase that loops up to a central balcony area that is sometimes open to provide additional upstairs seating. This area is complete with a bright red carpet and slightly more comfortable chairs and connects to a narrower balcony walkway that is closed to the public leading to the station offices. Beneath the round upstairs waiting area are the restrooms, water fountains and text that says snacks. These are the only food provisions in the station consisting of three vending machines: one for instant coffee, a standard vending machine for candy and chips, and automat machine next to a microwave as well as a Pepsi machine across it. 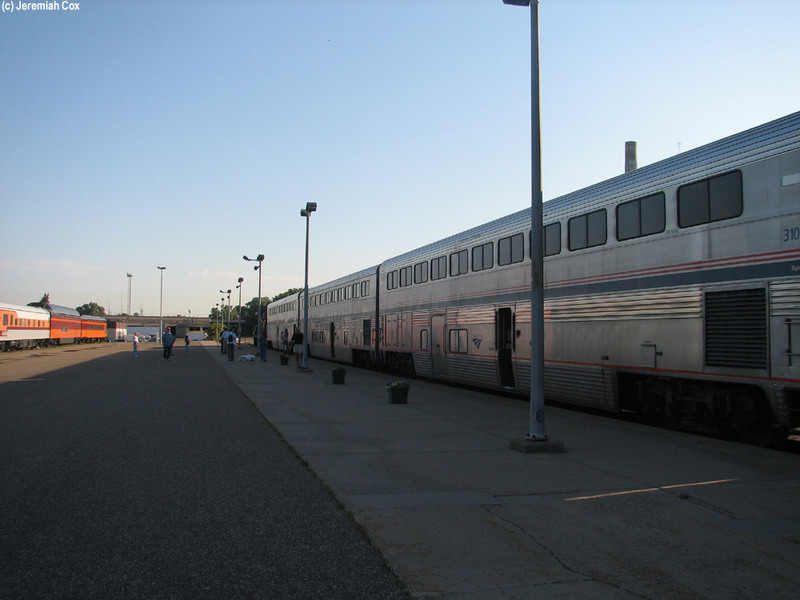 Continuing towards the opposite "Train" end of the station is a small enclosed waiting area with couches in it that is the Empire Builder First Class Lounge. 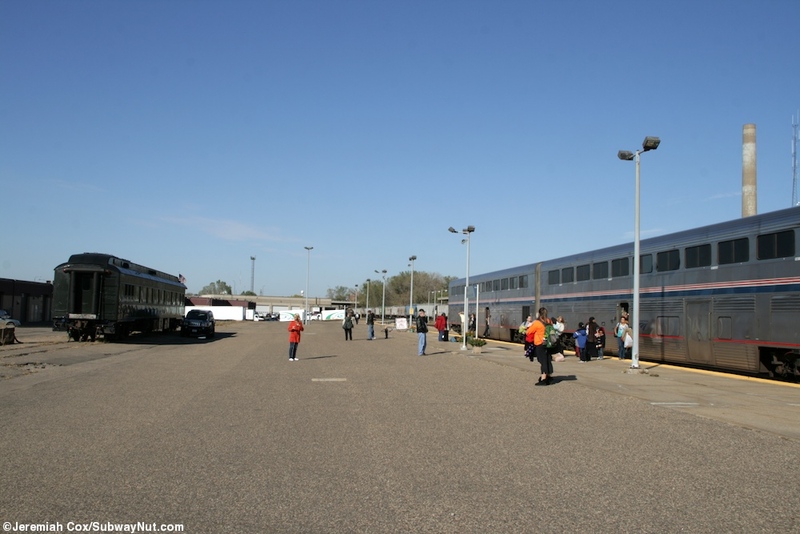 This waiting area is the only place unfortunately that allows a view of the rail yard beyond. 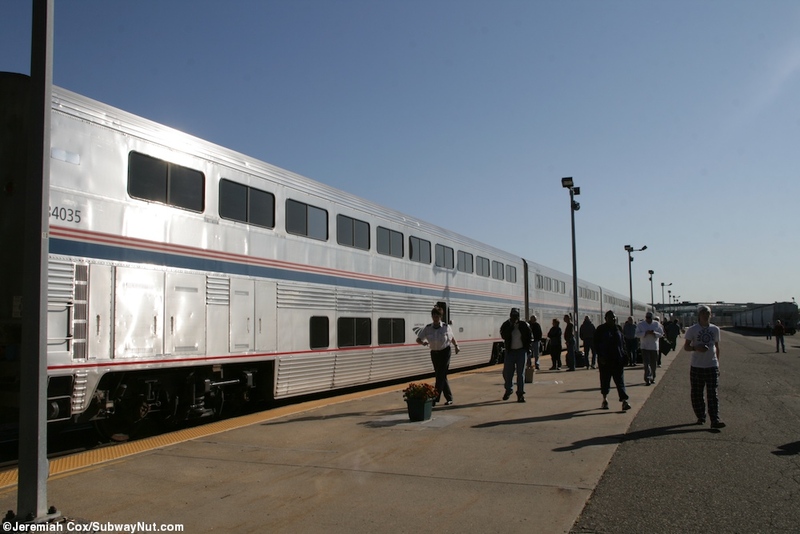 When it finally comes time to board the train tickets are lifted and seat checks given along with car (but not seat) assignments inside the station where passengers line-up when called by destination. This is all done from a desk right in front of the doors out to the extremely wide and bare concrete platform where all trains board on track 1. The only form of protection from the elements is a small walkway that has a black flat awning, an offshoot from the station building. 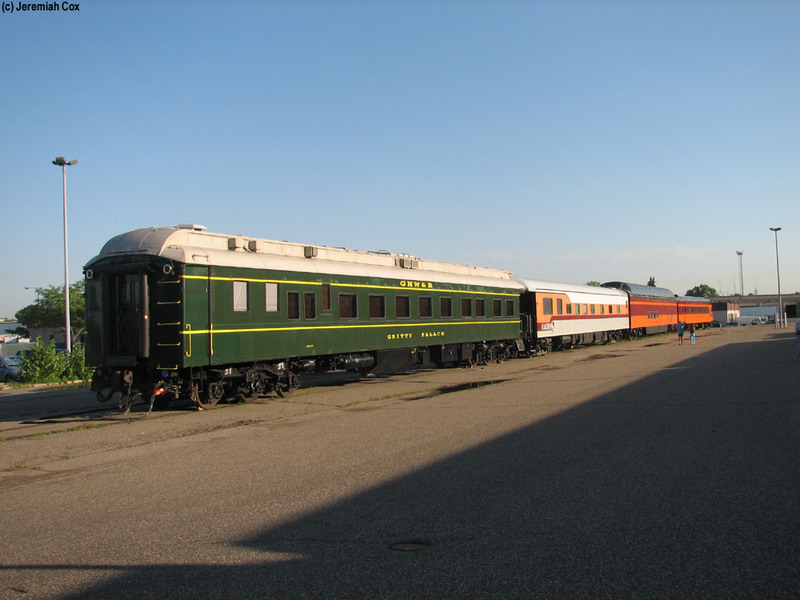 The train is stopped here along with some private rail cars in the train yard that are also visible. 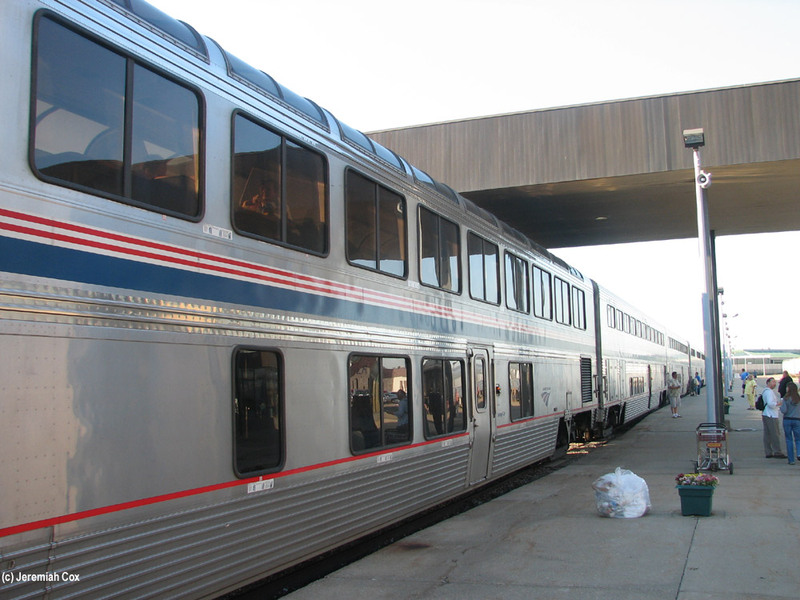 During peak seasons a single extra coach (called train #808 or #807 according to Amtrak's reservation system) is added to or removed from the rear of the train to provide additional capacity to Chicago. 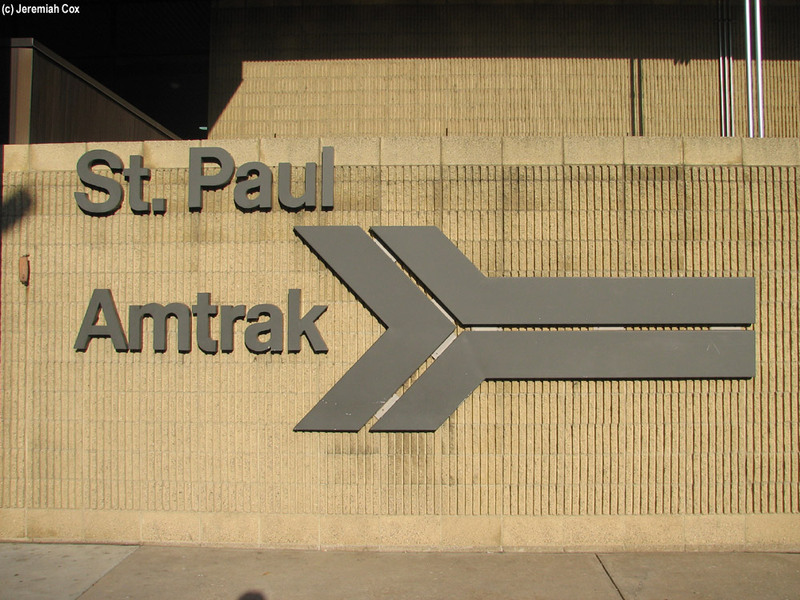 Recently the platform area has gotten a modern sign that says St. Paul/Minneapolis, MN and a tactile warning strip. Beyond the main platforms is an island platform for tracks 2 and 3 that generally sits unused but does have a long actual canopy incase station services are every expanded. Looking down the wide platform at Midway Station-St. Paul, MN. 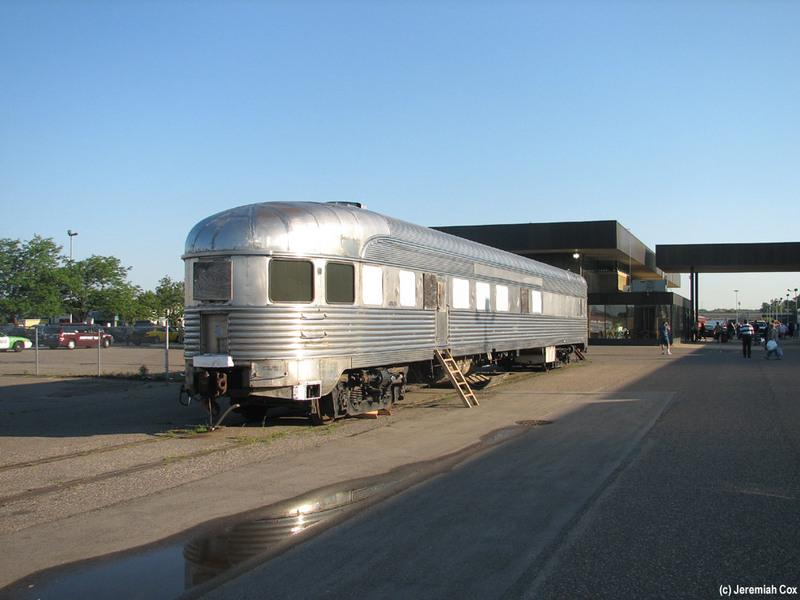 The Empire Builder #8/48 has just arrived. 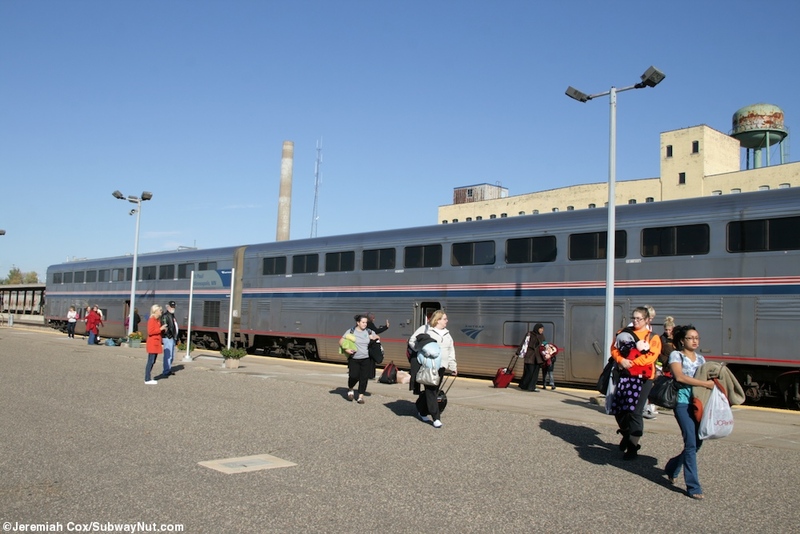 Looking towards the back of the Empire Builder, an additional train car is being attached for the crowds of people taking the train from here to Chicago. This extra car has its own train number #808.